Recently there have been some questions and discussions about python based expression functions and how parameters like usesGeometry need to be used. So I thought I’d quickly write down how this works. If the geometry or a column is passed in as a parameter you do not need to request it manually, you can even specify explicitly that you do not require the geometry or a column here. The expression engine will do the appropriate thing and request the geometry and attributes automatically. We can also write the function the following way. The difference is, that we will only ever be able to use it for this layer because it’s not portable. But sometimes there might be a good reason for doing that. Notice that the geometry and columns were mentioned in two places. The decorator ( usesGeometry=True and referencedColumns=['impact_radius']) as well as within the function body with feature.geometry() and feature['impact_radius'] . Also notice that it was checked if the feature actually does have a geometry. with if feature.geometry() . It’s a common pitfall, that sometimes features with a NULL geometry suddenly make expression functions fail. It’s very easy to oversee this in development and then hard to track down in a production environment. Better stay on the safe side. When you call this from an expression, you will call it the following way. Sometimes it’s required to actually make sure that you have all attributes available. In this case you can specify [QgsFeatureRequest.ALL_ATTRIBUTES]. If you don’t hardcode attributes or the geometry inside your function, specify usesGeometry=False, referencedColumns= . As a rule of thumb, prefer to do things this way, this makes it easier to reuse functions in the future. If you do hardcode geometry or attributes, specify this manually. Historically, this method has resolved the attribute index in a layer. If a layer has the attributes "id" , "name" and "height" and the expression is "name" || ': ' || "height" , this would just convert it to column(0) || ': ' || column(2) . Accessing attributes by index is generally a bit faster than by name, and the index is guaranteed to be static throughout a single request, so it’s an easy win. If we check if an expression only consists of static nodes, we can just precalculate it once and then reuse this value. This also works for partial expressions, let’s say 1 + 2 + "three" can always be simplified to 3 + "three" . And finally there are also the really funky functions. There is for example eval, which takes a string as parameter which can be parsed as an expression. Some examples are eval('7') which returns 7 (an integer), eval('1>3') which returns false and eval("condition") which reads the content of the field "condition" and treats it as an expression. So a new level enters the equation. Not only the parameter node itself (which is treated as a string) needs to be static, but also the expression that is created from parsing this string. For example when rendering with the 2.5D renderer and setting the building height based on the number of stories (assuming an average room height of 2.7 meters), there would be an expression eval(@25d_height) with the variable @25d_height being set to "stories" * 2.7 . The string is static ( @25d_height is a static layer variable). But we can’t precaculate the value ( "stories" is not static). However, we can still prevent the expressions engine from reparsing the expression with every iteration and potentially we can even precalculate parts of such an expression. Especially the fact, that the expression does not need to be parsed over and over again results in a big win. Lately I’ve been spending time porting a bigger plugin from QGIS 2.8 to 3 while maintaining 2.8 compatibility. One code to rule them all. My target was to have to edit the source code as little as possible to simulate a lazy or busy coder that has to upgrade his/her plugins. Lots of work has already gone into 2.14 to support PyQt 4 and 5 with the same code (Kudos to jef-n and mkuhn). 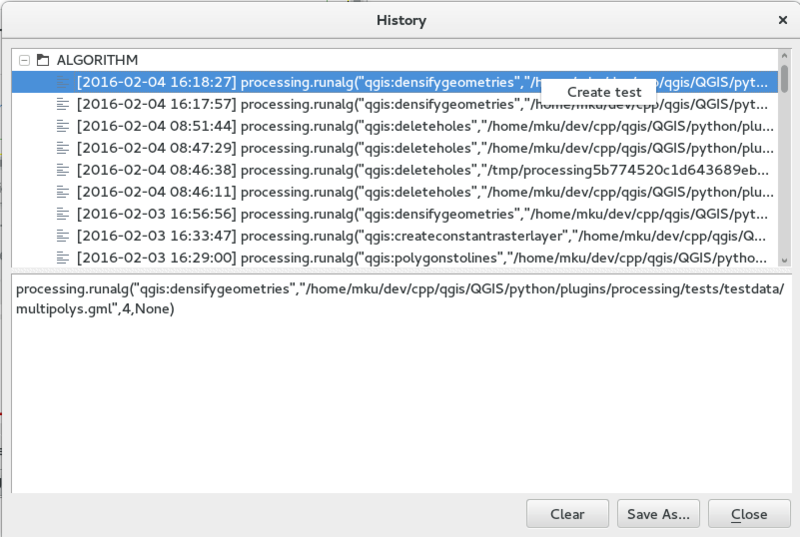 The qgis python package will then use the appropriate PyQt for you. But not all can be fixed in QGIS itself and this is why QGIS2compat can help you. QGIS2compat targets two main use cases. If you still need to rely on QGIS < 2.14 writing from qgis.PyQt will not work for you as the qgis.PyQt package is simply not there. And this is one of the two use case where QGIS2compat can help you. This feature is complete. The other use case of QGIS2compat plugin is the availability of a QGIS API compatibility layer which lets you write your code for QGIS 3 API and it will take care of adapting it to the QGIS 2 API. This feature is an ongoing work in progress since we are in the middle of API breakage period. So we do need your help to keeping adding new apicompat fixes (see below). available since QGIS 2.14 or fall back to qgis2compat. """Load MyPlugin class from file MyPlugin. :param iface: A QGIS interface instance. up-to-date place and gives you PyQt4 and PyQt5 support for QGIS >= 2.8. This can be done automatically by the 2to3 tool included in QGIS sourcecode. After running 2to3, update your __init__.py as explained above. before migrating) and fix the minor glitches that might have appeared. fix to be included in each pull request. so in do_load_project we get False instead of “my test argument”, why? well due to a subtle difference in the generated code. in the original code we had the signature triggered() which has no arguments, so in our lambda extra_arg gets passed my_arg. in the generated code, triggered actually has an optional param checked  which if emitted gets passed to extra_arg causing the problem. Behind the scenes a lot has happened to get ready for Qt5 and Python3. On the same codebase that is becoming the next release QGIS 2.16. This is really a great thing since we can focus work on a single master branch and I’m very happy that we got so far with this approach already. At OPENGIS.ch we have put a huge effort into getting the Travis CI test infrastructure to test our code with Qt5 and Python 3. This gives us confidence that we don’t have regressions introduced once we declare Qt5 and Python 3 to be default. At the time of writing we have 177 tests passing on Qt5/Python3 vs 211 tests on Qt4/Python2. Most of the missing tests are caused by a single issue (PyQt5 and NULL, see below). There is a script 2to3 that takes care of migrating “old” python code to portable code. That means, after running this tool on your python code it is compatible with PyQt4, PyQt5, Python2 and Python3. It uses the future library for python compatibility and a custom qgis.PyQt module that takes care of importing from the appropriate PyQt4 or PyQt5 modules. This can be done on build for core plugins with a new cmake option We do this on our (travis) CI builds when building for Qt5. Please note that the tool does a very good job (kudos to Jürgen at this point) but it cannot do everything, so plugin developers will also need to test in-depth and we’ll need to also prepare a migration guide that lists things to manually take care of. PyQt5 – just like Qt5 – is very similar to PyQt4. This is a good thing since it makes it easier to write portable code. The main issue which we have found so far is the lack of PyQtNullVariant and without this we don’t have proper support for NULL values. Definitely a no-go. Or we use to a different handling of attributes which would mean major manual updates to all plugins, IMHO also a no-go. The good thing is, there are good chances that PyQtNullVariant will be re-introduced in PyQt 5.7 but this means that our minimum Qt requirement will be Qt 5.7 which in turn means that older linux distros will be locked into using old QGIS versions. A lot of these updates have been done some time ago already. Qt5 (without python involved) runs quite painless. QField wouldn’t run without it. Implement many other changes which we want to work on before being able to ship QGIS with a version number 3.0. Processing just got a new testing framework to improve the long-term stability of this important plugin. And you can help to improve it, even if you are not a software developer! This is yet another piece in our never-stopping crusade to improve the stability and quality of the best desktop GIS on the market. You probably know processing. If you don’t: processing is the number one plugin to enable after every QGIS installation. It offers a very wide variety of geo-algorithms from generic one to very task-specific tools and allows building models and to completely automate workflows this way. Processing is being improved consistently and gets better with every release. But like always in software development, there is a risk, that an improvement can have undesired side-effects which break previously working parts of an application. A bit more over a year ago (when working still as a freelancer) I started a crowdfunding initiative for automated testing, a technique in software engineering also known as continuous integration. With every single change a developer does to an application, a number of functions – so called unit tests – are run and their outcome is compared to a known-good control dataset. This way side-effects can be detected early on and fixed before they get deployed to productive environments. This has been an amazing story of success. Since it has been put into place a lot of new unit tests have been added to a lot of QGIS functionality. A lot of bugs have been discovered by some servers that consistently test all the cool new stuff that comes in. Meanwhile we arrived at a point where we even test meta-quality of our codebase that makes the life for plugin developers easier: are new functions available from python? And do they come with documentation? However, until now processing was excluded from these checks. But no longer. To demonstrate the importance of this, take the intersection algorithm. Some months ago it started to fail in certain scenarios, caused by an update on the geometry engine. A totally unrelated change suddenly made the intersection algorithm behave differently. It just produced faulty results. The only thing was a small warning in the message log, a well-hidden place where you normally don’t check for warnings. If these unit tests had already been in place, this problem would have triggered an alarm right away. No longer, as of now, at least this same problem will not happen again! But as you can see, there is only a small number of all the algorithms in processing being tested right now. Is your favorite one not yet included? That’s where you come in. That’s where the whole community of QGIS can help to make QGIS incredibly rock-freakin’-solid! The tests are based on a very simple infrastructure. The first piece is already in place. The test datasets have been carefully developed to contain all kind of different geometries and attributes. This ensures that the tested algorithms are robust against all kind of side-effects. Make sure you have a copy of the QGIS git repository. Choose an algorithm to test. Check the algorithm_test.yaml file that it’s not yet in place. Run the algorithm and redirect the result to python/plugins/processing/tests/testdata/expected . Preferably in gml format. Manually check, that the result you receive is correct and that there have been no errors. This step is important! Open the Processing menu entry History. Right click the entry and click on Create Test. You will see a yaml specification that describes your algorithm. If it looks good, copy it to the end of python/plugins/processing/tests/testdata/algorithm_test.yaml . Request that your test is integrated. It will automatically be run on our test infrastructure. If it is good, it should be integrated shortly. As a by-product of this development, a couple of things have been developed and fixed. Implementation of a qgis.testing python module. This comes with some nice pieces which can be used by every python plugin for creating its own unit tests. It comes with a mock iface and a method to compare vector layers with control over attribute and geometry comparison. Too many copies of a mock iface are already floating around in different plugin projects. Help making this one the best and only one! Several fuzzy comparison options have been implemented (epsilon for geometries coords, epsilon for attributes…). QgsVectorFileWriter is now able to produce geometry collections as output. While we cannot represent them in QGIS, a processing algorithm can now create such an output (a number of file formats support this. Shapefiles don’t.). A crash has been fixed that surfaced when running certain algorithms with null geometries. December traditionally is an amazing time since the weather is usually quite forgiving to long working hours. Therefore the first parts of our recent crowdfunding project for 2.5D rendering have been merged into QGIS master and will be shipped with QGIS 2.14. It’s something of the sort of development that we really, really, really like here at OPENGIS.ch: an implementation that adds enormous flexibility and enables the user to use QGIS in ways that we never thought of. Say hello to geometry generators. Geometry generators allow to use expression syntax to generate a geometry on the fly during the rendering process. The resulting geometry does not have to match with the original geometry type and you can add several differently modified symbol layers on top of each other. It couldn’t be easier to use. Open the symbology dialog. 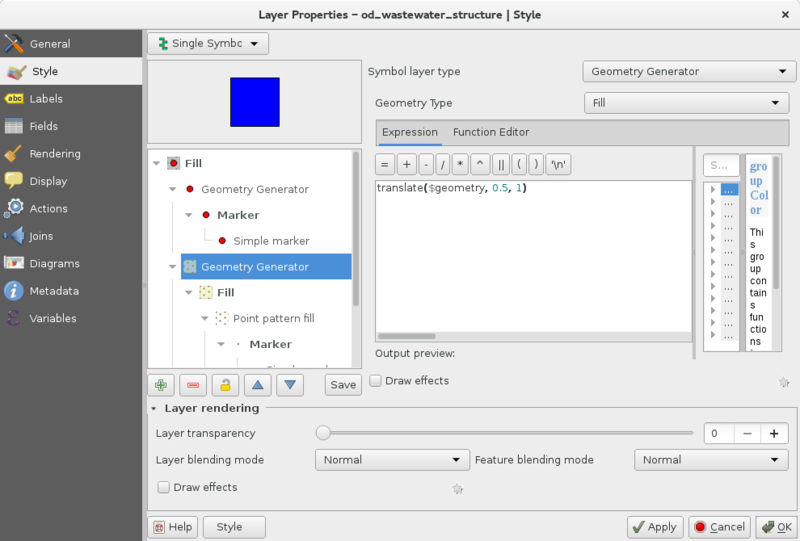 Choose geometry generator as symbol layer type. Choose what kind of symbol you would like to generate, write your expression and style it in whatever way you like. Show the world what you can do with it. Special thanks to Nicolas Rochard and for the help to bring this project into shape. And to Nyall Dawson for his invaluable inputs throughout the planning and reviewing process.